Happy Birthday/Blogiversary to my blog! One year ago today I did my first blog post, about a food I don’t even like (beets, blech), and with a picture that was horrible. What was I thinking? Good question. Since then, I have only posted foods that I love and have (hopefully) gotten a little better with the camera. 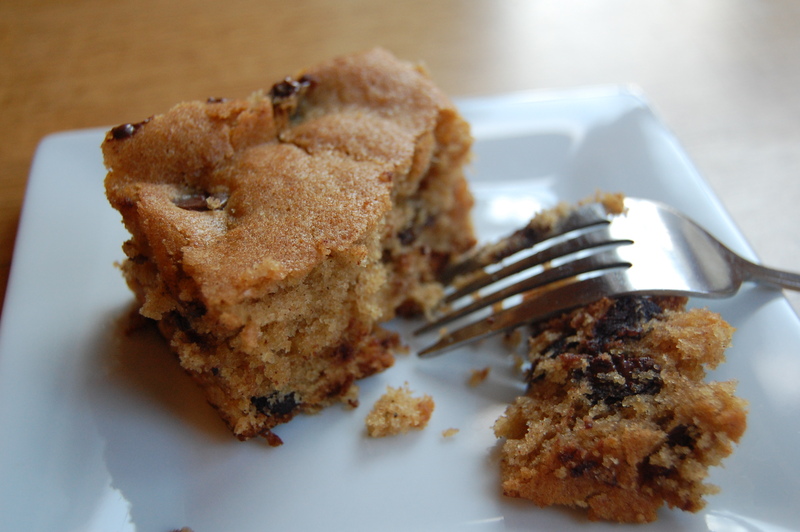 In honor of one year, I have a delicious fall treat for you: Pumpkin Chocolate Chip Bars! So good. 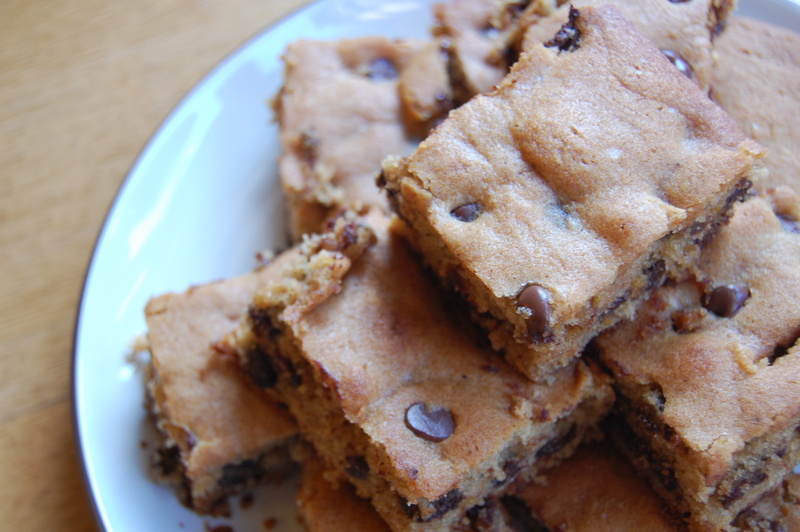 Of course, I found them on Pinterest (original recipe here). 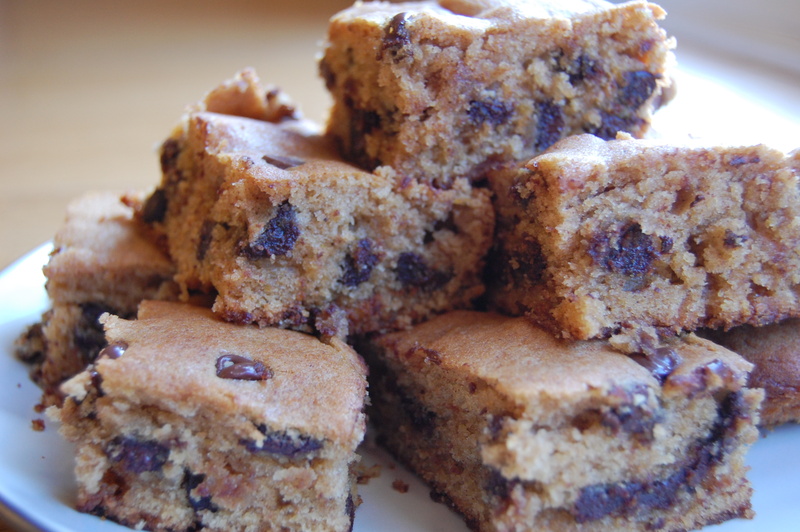 I was thinking they would be more like a cookie bar, but they turned out much more cake-y. Still, they were moist (sorry, but they were), flavorful, and delicious! Best of all, I had pureed pumpkin in my freezer from a pumpkin I roasted last fall, and I finally got to use it up. OK, on second thought, maybe that’s not best of all. Best of all was savoring these delicious chocolate-y pumpkin-y bars. Preheat oven to 350°F. Line a 13×9 pan with aluminum foil, leaving an overhang over the handles. This is what the original recipe’s instructions call for, but I’m sure you could also just grease the pan and that would be fine. Whisk together the flour, spices, baking soda, and salt. Set aside. Using a stand mixer or hand mixer, cream together the butter and sugar on medium-high until smooth. Beat in the egg and vanilla. Beat in the pumpkin puree. It’s going to look curdled, but don’t worry about it. Now add the dry ingredients and mix on low until just combined. Stir in the chocolate chips. Spread your batter into the prepared pan. Bake for 35-40 minutes or until a toothpick comes out clean (or use a knife because you never have toothpicks). Put these out on your table when you have friends over, and they will not live to see tomorrow. The bars, that is. Not your friends. Although, I could see why you would want to kill your friends if they ate all of them. 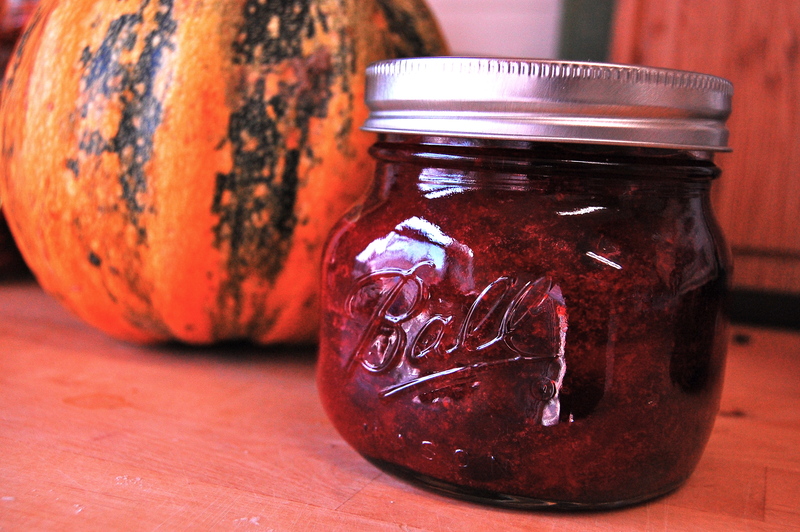 Now, what are you going to do with that leftover pumpkin puree? I had half a cup left over, but if you use canned pumpkin for your bars, you’ll probably have about a cup left. 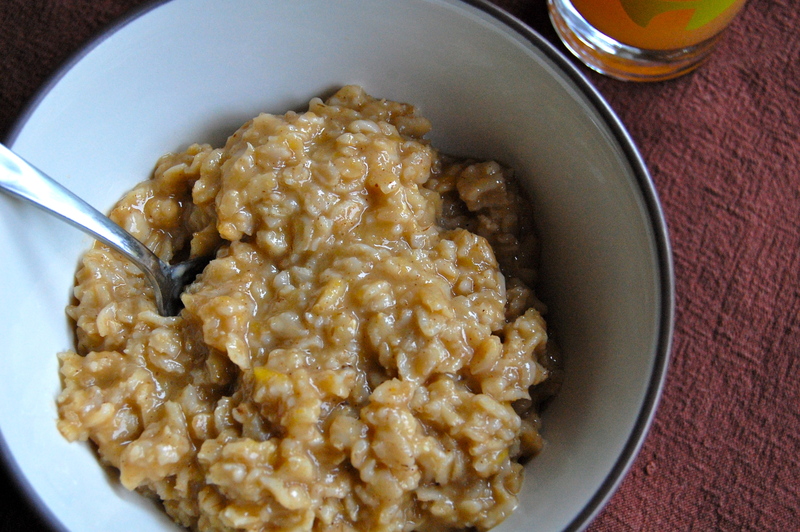 This morning I had the brilliant idea to mix it into my oatmeal! I don’t have an exact recipe, per se, just some rough guidelines. But it was really good. Prepare your oatmeal as usual. When it’s almost done, turn the heat down to low. Mix in 1/2 cup pumpkin puree (for two. 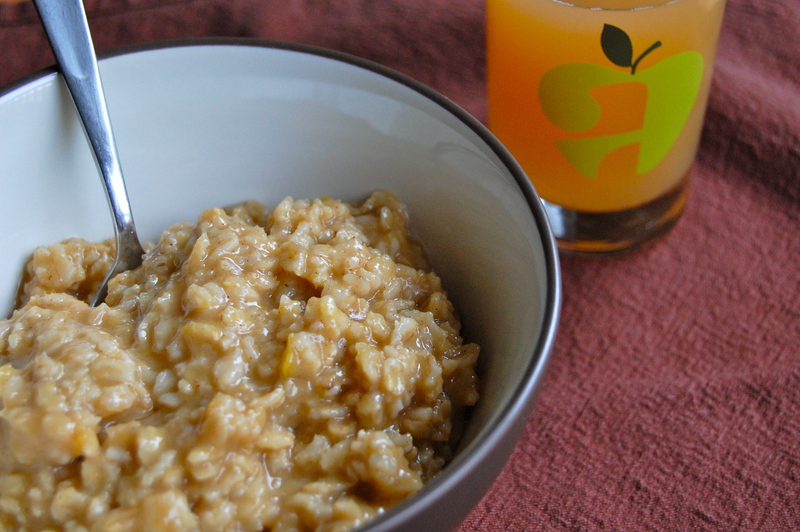 If you want oatmeal for four, add 1 cup of pumpkin). Mix in about a tablespoon of apple cider, a few good sprinkles of pumpkin pie spice, a few tablespoons of brown sugar, and a tablespoon of almond milk. (My favorite almond milk flavor is unsweetened vanilla.) Obviously, taste and add more of anything if necessary. Even though cinnamon is part of the pumpkin pie spice, I added a little more cinnamon on top of that. Enjoy with a glass of apple cider. Yay fall! One of my favorite cheeses of all is goat cheese. I love it. So creamy, tangy, and delicious. Mmmm… yummy. So when I saw this recipe from Giada at home, I knew I was in for a treat. A friend requested that I post a recipe with sweet potatoes and goat cheese, and this is not that, but it’s close, right? Sweet potatoes, butternut squash — same diff. Kind of. I’ll have to think up a recipe involving sweet potatoes and goat cheese later. Any excuse to incorporate goat cheese into a recipe! Put an oven rack in the top third of the oven, and set your oven at 425° F.
Spray a baking sheet liberally with cooking spray. 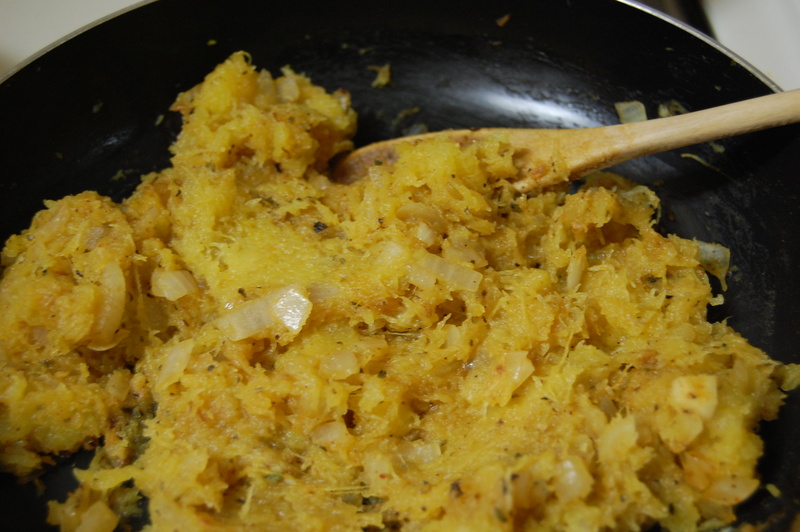 In a large bowl, combine the squash and onion. Drizzle with olive oil and mix thoroughly so that everything is coated in oil. Season with salt and pepper. 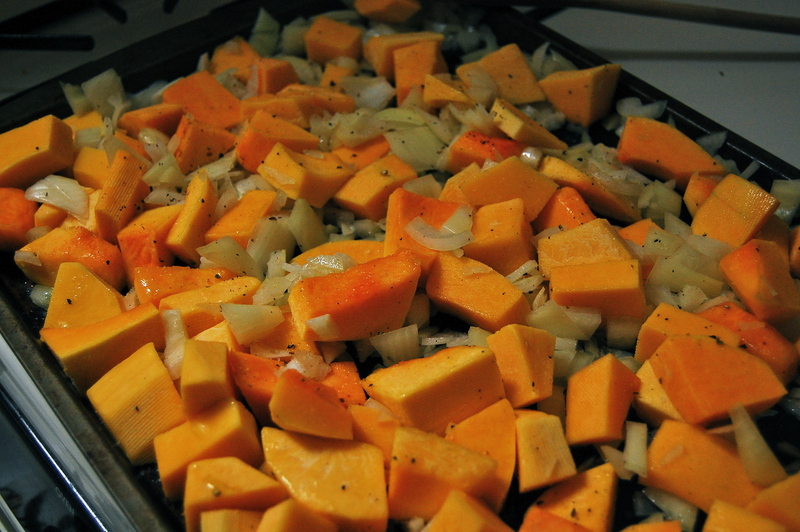 Arrange the vegetables in a single layer on the baking sheet and cook for 40-45 minutes until squash is tender. Keep an eye on the onions — I wound up with a few burnt pieces because they were in the oven for a bit too long (Confession: I got distracted watching the Vampire Diaries on Netflix. Hey, what can I say? I’m a sucker for trashy TV shows). Once the veggies are done cooking, remove the pan from the oven and set aside to cool. While the squash and onions are cooling, toast the walnuts. This can be done in the oven or on the stovetop. I prefer the stovetop so I can keep an eye on them. Heat walnuts in a dry skillet over medium heat for one two minutes, tossing or stirring frequently, until golden brown and fragrant. Set aside. Make pasta in a large pot, following the directions on the package. When it’s done, reserve about a cup of the pasta water and set aside. Drain the pasta. 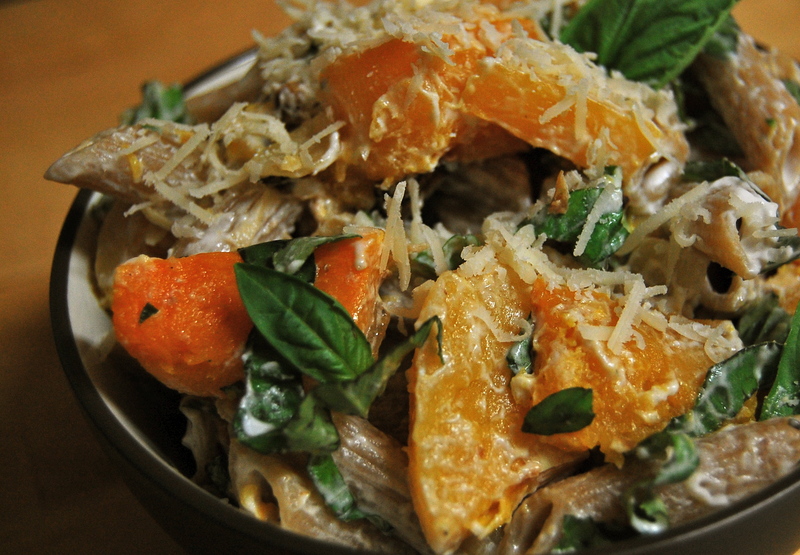 In a large serving bowl add pasta, goat cheese, and about 1/2 to 3/4 cup of the pasta water. Toss until the cheese has melted and formed a creamy sauce. The original recipe calls for 1 cup of water but I thought this would be too much. You can add as little or as much water as you like, depending how thin you want the cheese sauce. Add squash and onions, walnuts, and basil. Toss well, and season with salt and pepper. 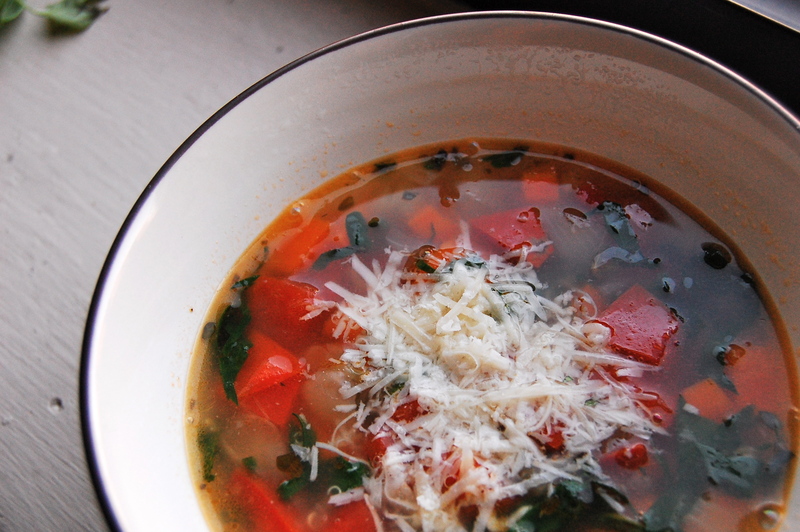 Top it off with parmesan and you’re good to go. The end result is a creamy, flavorful, and filling pasta dish packed with veggies. Enjoy! 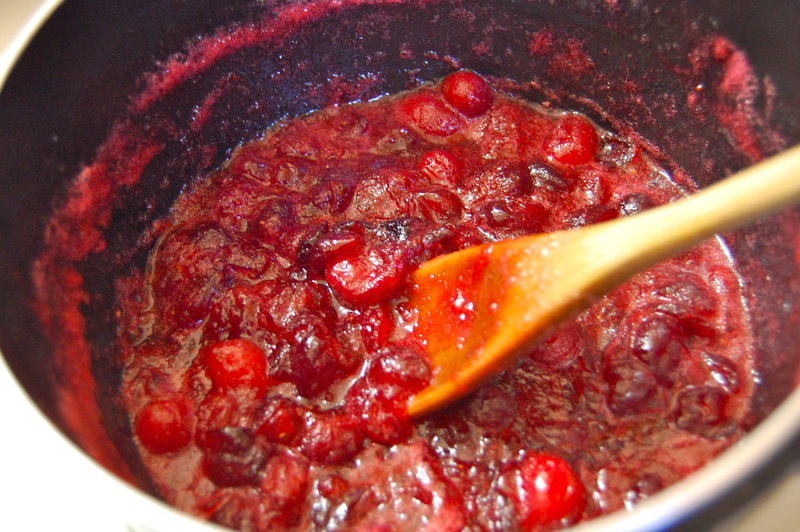 I don’t know about you, but when I was growing up we ALWAYS had cranberry sauce from a can at Thanksgiving. Nobody ever bothered to make the real thing. And so, until yesterday, neither had I. I didn’t realize how stinkin’ simple it is! (and how much more delicious it is!) 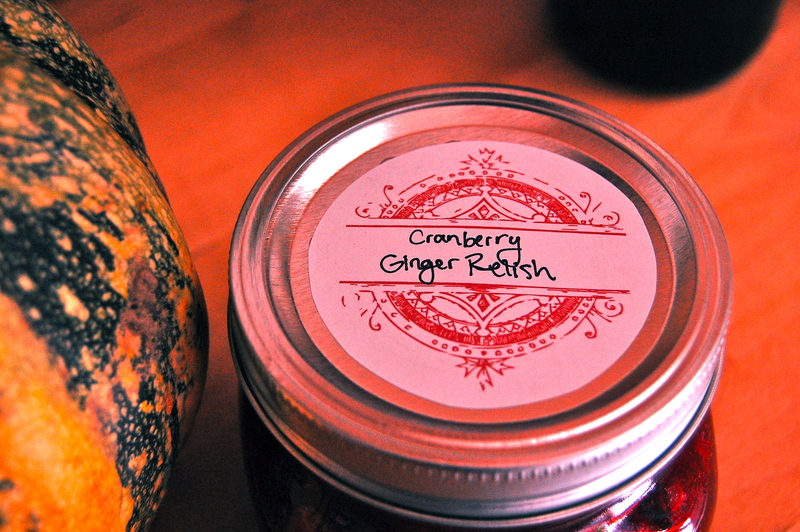 I chose to go with something a little different than your typical cranberry sauce. It’s got ginger in it for a little kick. If you were planning on going with the can, but want to try something new, this is the recipe for you. You can do it! Think outside of the can! It only takes about 15 minutes of your time. Although you might be crazy to go to the store today, I’m sure you won’t be the only one running out for last minute things. Luckily, this recipe requires very few ingredients. It’s another Pinterest find — this time from Martha Stewart. Thanks Martha! Lately, instead of buying fresh ginger, I’ve been using this ginger from a tube. OK, that sounds weird and gross, but I found that in the past whenever I needed ginger for a recipe, I would hardly ever use the entire thing, and it would almost always go bad. The tube from the store (which really is just ginger and something to preserve it) tastes the same and lasts much longer in the fridge! Here’s a link to a pic so you can hunt it down at the store. OK, on to the recipe. 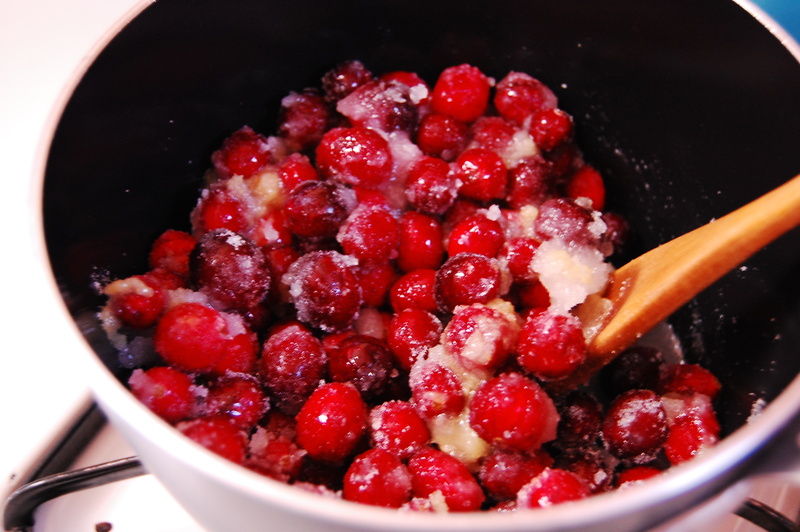 When it comes to a boil, reduce heat to medium-low and simmer until most of the cranberries have popped — about 10-15 min. Look at that gooey mess! Stir in the vinegar. Remove relish from the heat, let cool to room temperature, and serve. You can’t tell from the pictures, but the sauce is a beautiful, deep, ruby red, and oh-so-delicious! Seeing as Thanksgiving is in just a few days, I thought I would do some extra posts this week and share a couple of ideas for what to bring if you’re not hosting, or what to make if you are. If you are looking for a super easy side dish, look no further. Since becoming a vegetarian, sometimes people assume I’m missing out on all of the Thanksgiving delicacies, but this is just not the case. Trust me, I can fill my plate with side dishes galore, and I enjoy my meal every bit as much as others enjoy their turkey. I can also enter into a food coma without the turkey tryptophan. Impressive, right? There are so many delicious vegetables and fruits that are in season right now: sweet potatoes, parsnips, carrots, sunchokes, rutabaga, winter squash, pomegranates, pears… and these all make for some incredible side dishes. The other night I wanted to make something quick and easy for dinner, so I thought I would glean some inspiration from my ugly lentil soup recipe, and use some of those ingredients for a side dish. 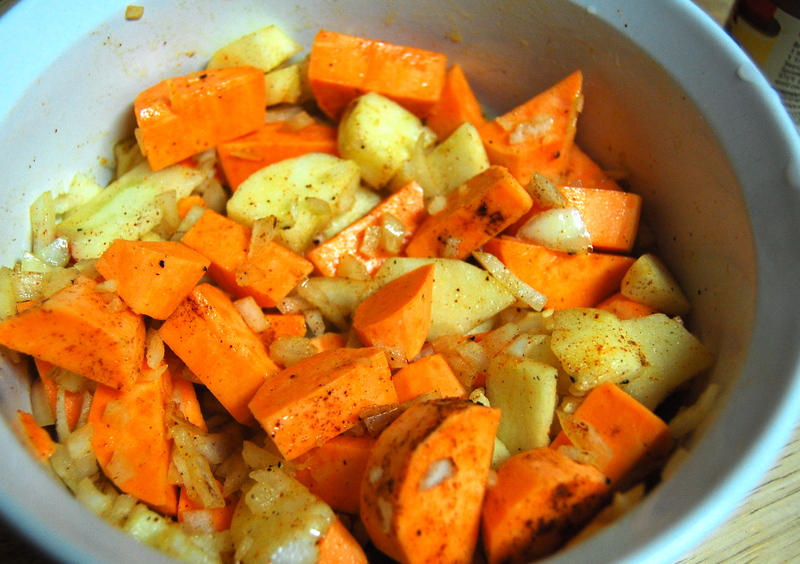 I combined sweet potatoes, onion, apple, and spices for a really yummy side. I’m not actually making this for Thanksgiving, but you could! Preheat oven to 375° F. Mix all ingredients in a baking dish, cover and bake for 30-40 minutes (until potatoes are soft). I chose to eat it as is, but I bet it also would be good if you mashed it up. I think I’ll do that next time. Let me know how yours turns out! I’m back, y’all. I’ve missed you. I could make lots of excuses for being gone for two. whole. weeks, but really I just need to plan my time better. Story of my life. I have realized that if I don’t plan ahead for a recipe to post each week, it may not happen. So, barring a natural disaster, or me getting pregnant* or something, get ready for posts every week. Hopefully. Anyway. I am really excited about this recipe. Last week my dear friends and I decided to have dinner together before heading out to a Halloween party. I assessed the situation in the fridge. Hmm… tortillas, squash… umm? Then I had a stroke of pure genius. OK so maybe it wasn’t genius, but it was pretty good. 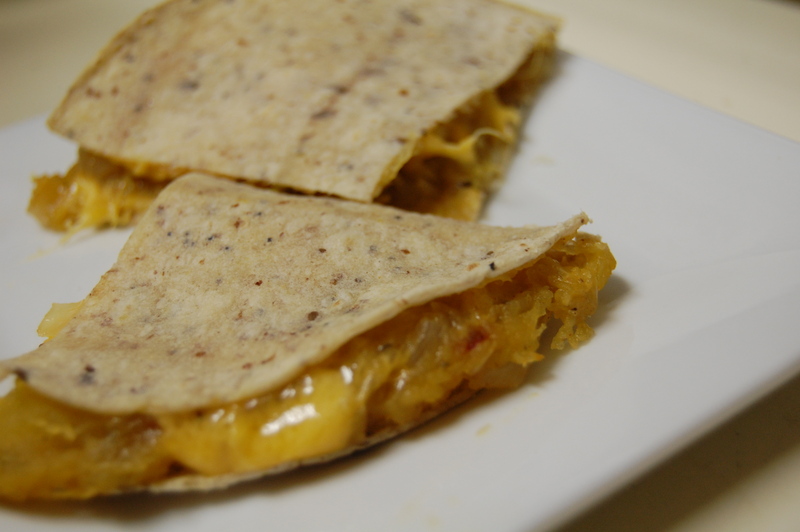 I thought, let’s make squash quesadillas! 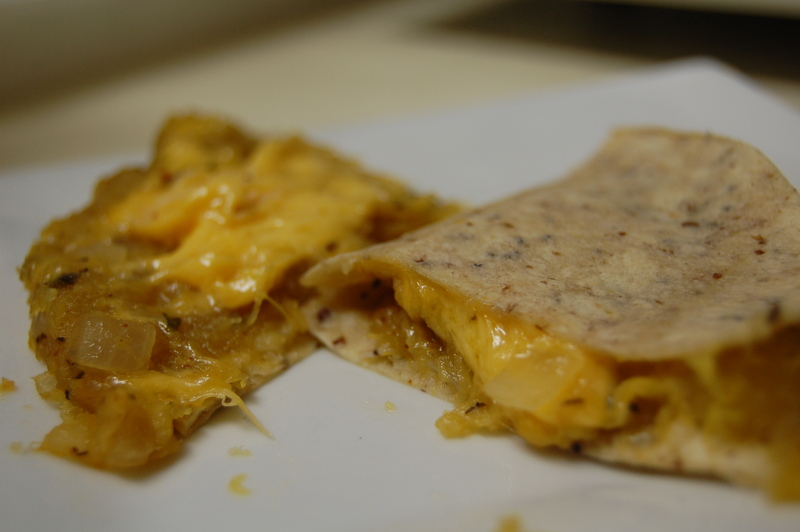 So I gathered what I had: a buttercup squash, garlic, shallots, tortillas, mexican-blend cheese, some spices. And hey, it turned out pretty good. But I didn’t feel like taking pictures that night, so tonight I made it again, except I made it even better, because I actually followed a recipe. I remembered my friend had made these yummy sweet potato quesadillas last year, so I decided to go off of that recipe, modifying it a bit. My friend found this recipe in the awesome Mennonite cookbook: Simply in Season. For this recipe, I used an acorn squash. I think you could pretty much use any type of winter squash. (Like I said before, I used a buttercup squash when I originally made this.) Whatever floats your boat. The original recipe called for sweet potatoes, which is also delish. To roast the squash, cut in half and stick face-down on a baking sheet with a rim. Roast for about 50 minutes at 375° F. The time will vary depending on the size of your squash. It’s done when you can easily stick a fork through the skin. 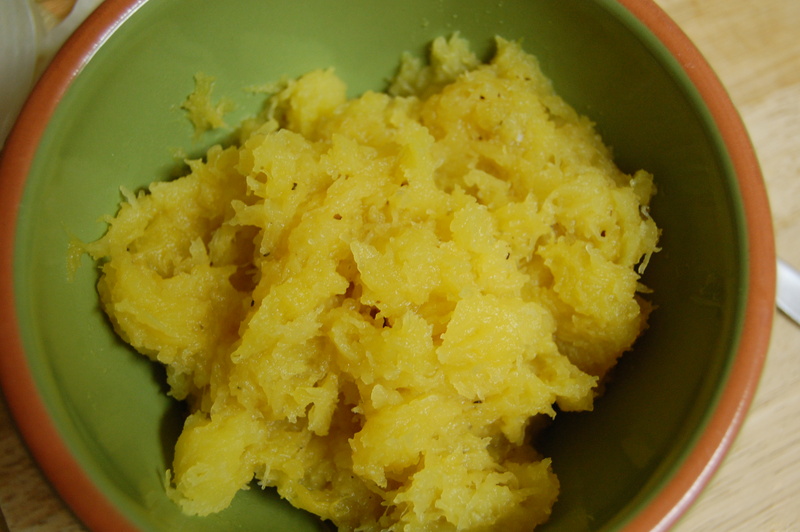 Scoop the squash out of the skin and mash it up. Add salt and pepper to taste. Set aside. Add the spices, and cook for another minute. Add squash and heat through. Stir frequently. When it’s all heated, add some more salt & pepper if needed. 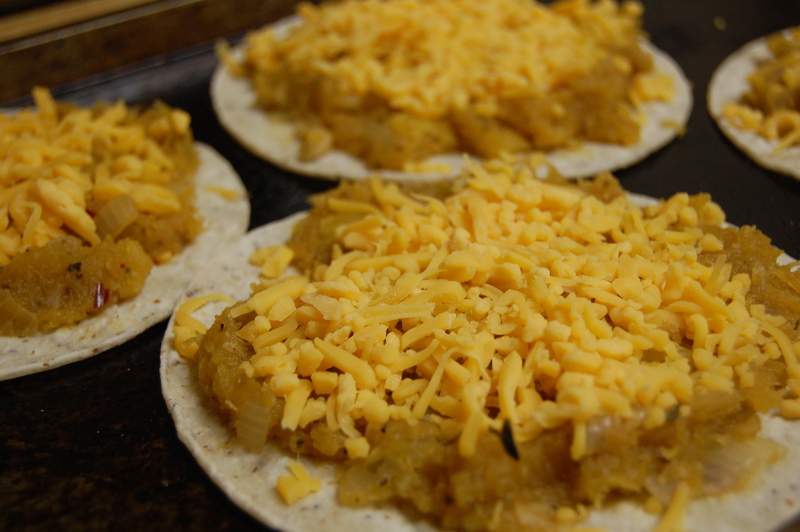 Spread about 1/2 cup of the squash mixture onto half of the tortilla. Sprinkle some cheese on — as little or as much as you’d like. Fold tortilla in half. Place on lightly oiled baking sheets. Brush tops lightly with oil. Or if you have corn tortillas, get creative. Look at that gooey, cheesy, squashy goodness. (Sorry vegans). *Please do not read into this that I think getting pregnant is equivalent to a natural disaster. But it would be sort of bad timing. Let’s finish up grad school first, shall we? Yes, thank you. 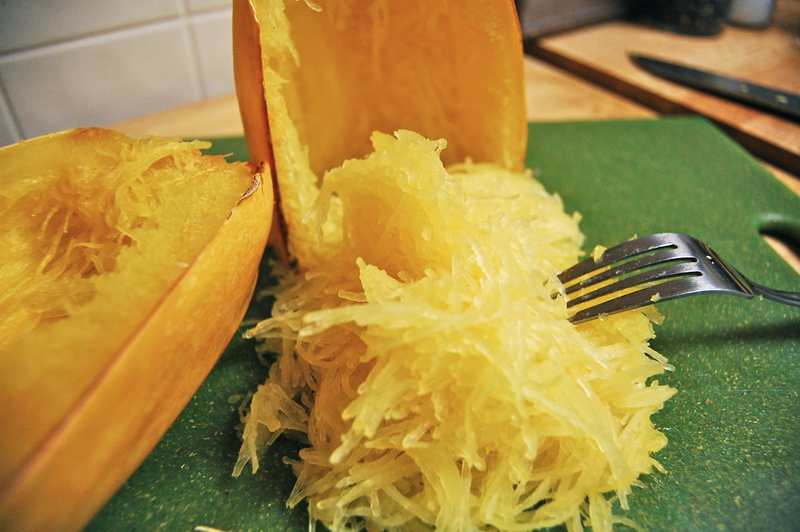 Last year I discovered a delightful thing called the spaghetti squash. I don’t know how I went so long in life without knowing about this yummy veggie. 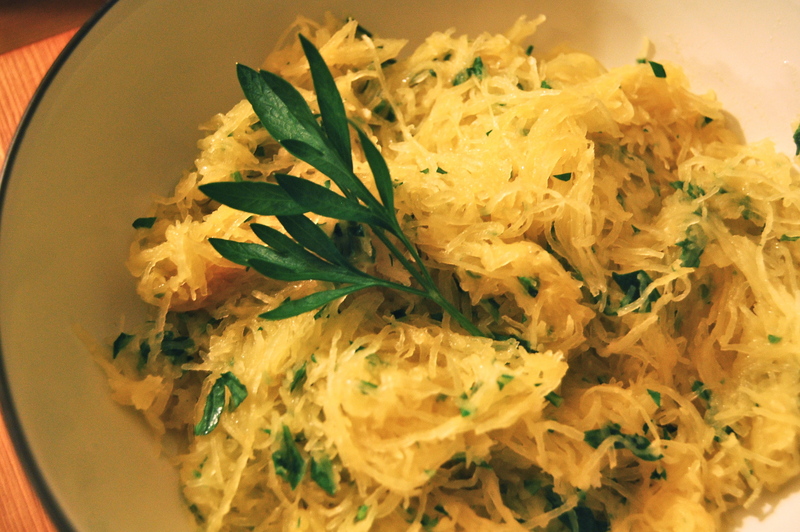 Spaghetti squash is great because you can use it as a replacement for spaghetti in most recipes. It’s way lower in carbs, of course, and has a heck of a lot more nutritional value than real spaghetti. Of course it’s not going to taste like spaghetti. It’s squash, and it tastes squashy. It also has a bit of a crunch to it, but trust me, it’s good. Add some garlic and cheese, and you have a delicious and simple side dish. I found this recipe last year from Steamy Kitchen, and it is so yummy! You can basically pick whatever herb you want to put in there — parsley and basil are both great, and I think rosemary would be good too. Whenever I fly home to visit my parents, I try to make them a new vegetarian recipe to broaden their culinary horizons. My mom was flabbergasted when I became a vegetarian, because growing up, meat was always at the center of meals. You could not have a meal without meat. She never knows what to make me when I come home, so I like to show them that it’s possible to have a perfectly delicious, nutritious, and filling meal with no meat in sight. Last year I made this recipe and my Dad loved it. He went back for seconds and thirds and probably fourths. It was the first time he had tried spaghetti squash, and he loved it so much that he has even made the recipe himself a few times. Success! Preheat oven to 375° F and throw the whole squash in. Bake for 60 minutes until you can easily cut into the skin. Let the squash cool for a bit until you can handle it without burning your hands. Cut the squash in half lengthwise. Get rid of the seeds with a fork. Hold up half the squash, and use the fork to scrape out the insides. It will come out in long strands, just like spaghetti! Isn’t it pretty? If you’re having a hard time getting the strands out, it probably needs to cook for a bit longer. Stick it back in the oven for a few minutes. 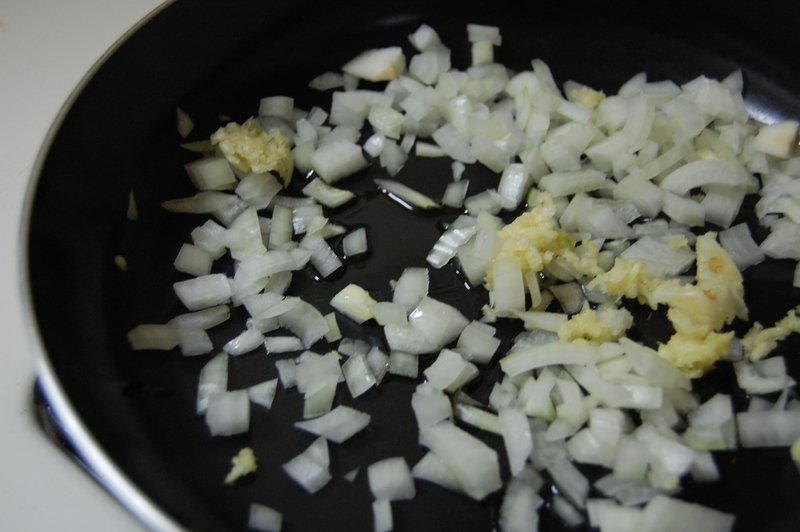 After you’ve scraped til you can scrape no more, set the strands aside and grab a large sauté pan. Heat the butter and garlic over medium heat. 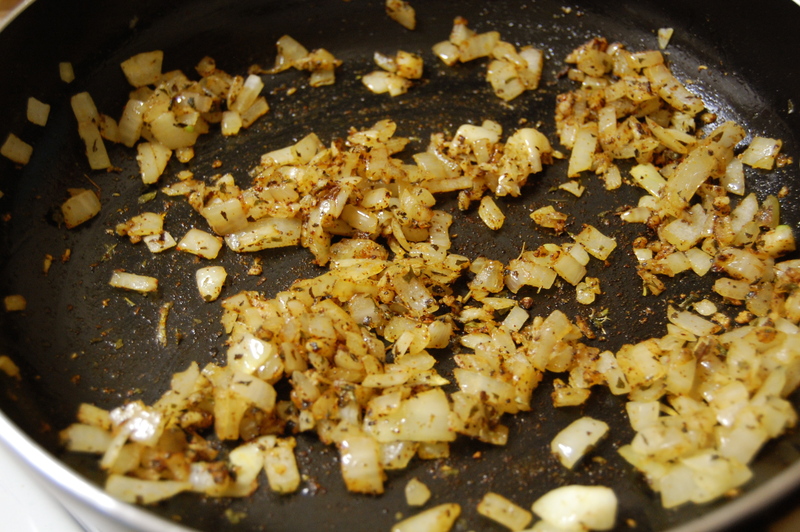 Allow the garlic to sauté for a couple of minutes, and then add the squash, salt, and herb of your choice. Mix it all up and then add your cheese. Add more salt as needed. Serve piping hot, and enjoy! This week, summer decided to make a comeback in Chicago. As much as I love the crisp fall weather, I’m not complaining. 74°, sunny, and breezy is OK in my book. So maybe I should be making some recipe reminiscent of summer, but I’m not. I’m making soup again. Deal with it. This week in our CSA, we got fennel. I had never eaten fennel before, and I’m not gonna lie, I was a little scared of it. I mean, the thing smells like licorice. What kind of vegetable smells like candy? As you might be able to guess, I am not a fan of licorice. Just thinking about it grosses me out. So I was a little nervous to try this soup, which not only includes fennel, but also fennel seed. Double licorice whammy. But I decided to go ahead and try it, because I didn’t want it to go to waste. We also got onions and spinach in our box this week, which I was able to use in the soup as well! After looking at the title of this post, you might be asking yourself “what is clean eating?” Good question. Let me google that. (I love googling.) Alright, so my sources tell me that clean eating involves eating only fresh, unprocessed, whole foods. For all you meat-eating naysayers out there, don’t worry, you’re still allowed to eat meat. But it means eating meat that is whole and straight from the butcher. No chicken McNuggets for you, my friend. I would also add that no meat could be considered “clean” unless it is from a sustainable source. This means grass-fed, free-range, preferably local, and organic. You don’t even want to know all the junk that goes into the other meats, but that is for another post altogether. Clean eating also includes eating lots of plants! This does not mean eating french fries and making excuses like “but, it’s a potato.” No, that is not a potato. Though still damn tasty, I know. Eat vegetables/plants in their whole form, straight from the ground, tree, or bush — preferably veggies from your local farmers market, a CSA if you get one, or organic from the store. You get the picture. Summary: clean eating = don’t eat garbage. There is a nice little blog post here for more info about clean eating. Now on to the recipe. I must warn you that this takes a lot of prep time. Lots of peeling, chopping, and chiffonading (more on that later, but don’t I sound fancy?). It probably took me close to an hour in prep work. (Disclaimer: I’m really slow at that stuff.) But don’t worry, it was worth it. After all the prep work, the soup doesn’t take long to cook, and you get the delicious reward of a CLEAN and tasty meal. 1. The bulb of fennel we got in our box was reeeally tiny. Itty bitty. Usually fennel has this massive baseball-sized bulb. Not the case here. So instead of the 1 cup the recipe called for, I only got about 1/4 cup. But it turned out totally fine. So any amount between 1/4 cup and 1 cup will be just fine. I’m assuming with the whole cup you’ll get a little bit of a stronger fennel flavor. 2. 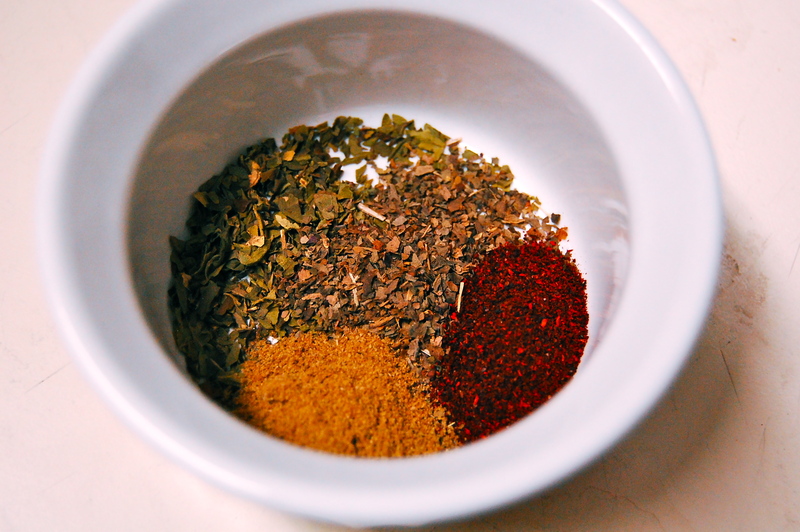 To crush fennel seeds, you need a mortar & pestle or a coffee grinder. I had neither. Well, I have a coffee grinder, but it was covered in coffee grinds at the time and I didn’t feel like cleaning it out. So I did the really tedious thing and just attempted to crush the seeds up as best I could using a large spoon. It didn’t work so well, and it took a long time and was extremely annoying. 3. If you’re at all like me, you looked at this recipe and said “what the heck is chiffonade?” Yeah. Here’s a video. Actually, chiffonading was kind of fun! I had so much fun that I decided to chiffonade my basil in addition to my spinach. Enjoy. 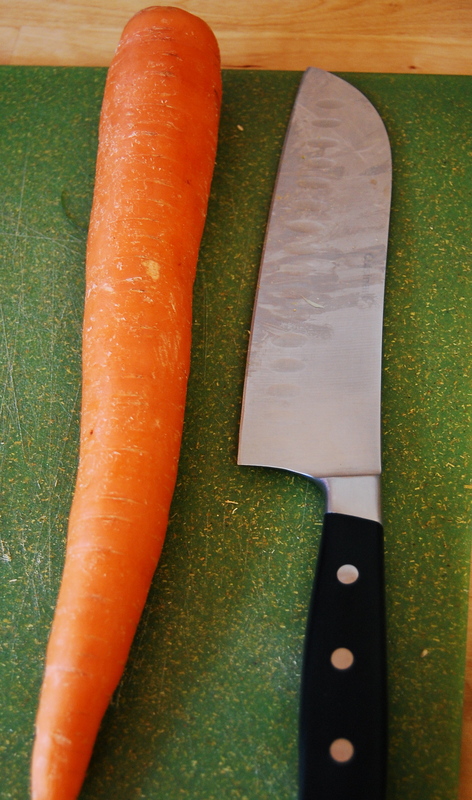 One more thing… look at this carrot. Monster carrot, right? With this baby I got an overly heaping cup-full of diced carrot. Sorry, had to share. Alright, I’m done now. On to the soup, I promise. 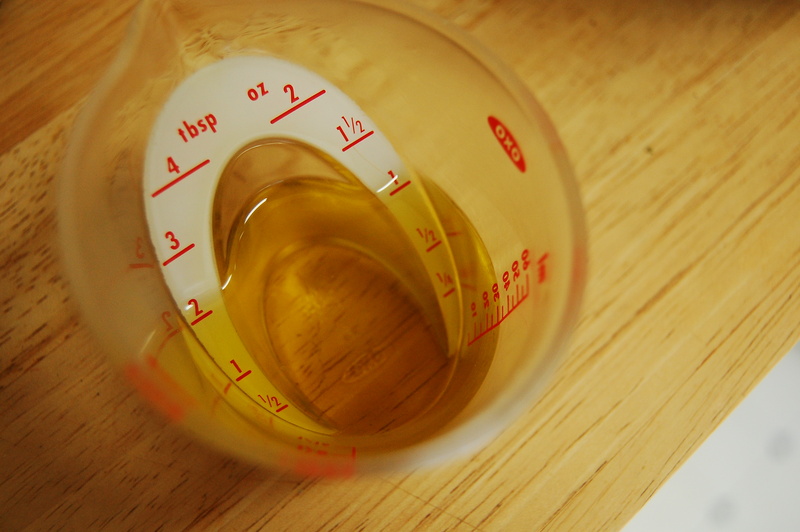 In a large, heavy bottomed pot, heat oil over medium heat. The following is not a picture of oil heating up in a pot. It is a picture of your new best friend. I love this thing — so great for measuring out tablespoons of liquid. Much easier and much less mess this way. I got mine at Bed Bath & Beyond. 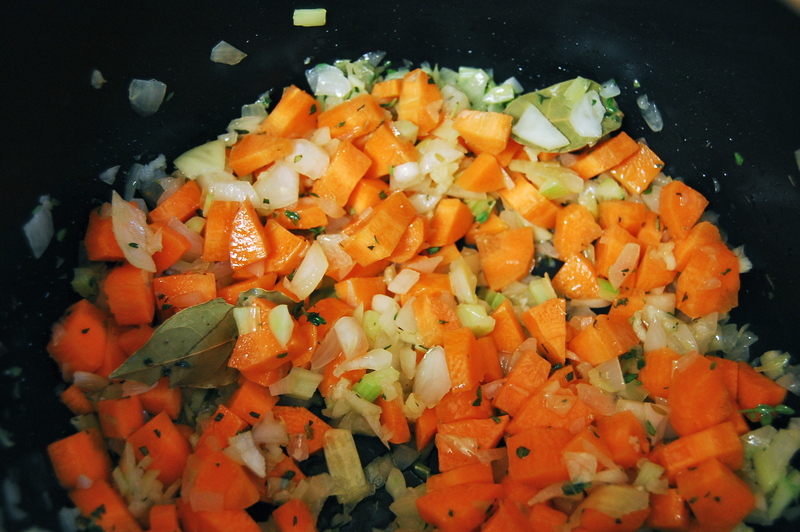 Once your oil is heated up a little bit, add carrots, fennel, onion, garlic, bay leaves, thyme and fennel seeds, and cook, stirring often, until vegetables are tender, about 8 minutes. Add 6 cups water, beans, tomatoes, and quinoa. Heat to boiling then reduce heat to low and simmer until quinoa is tender, about 20 minutes. Remove bay leaves and season with salt and pepper. Stir spinach and basil into soup just before serving in bowls. Garnish each with 1 Tbsp cheese, if desired. 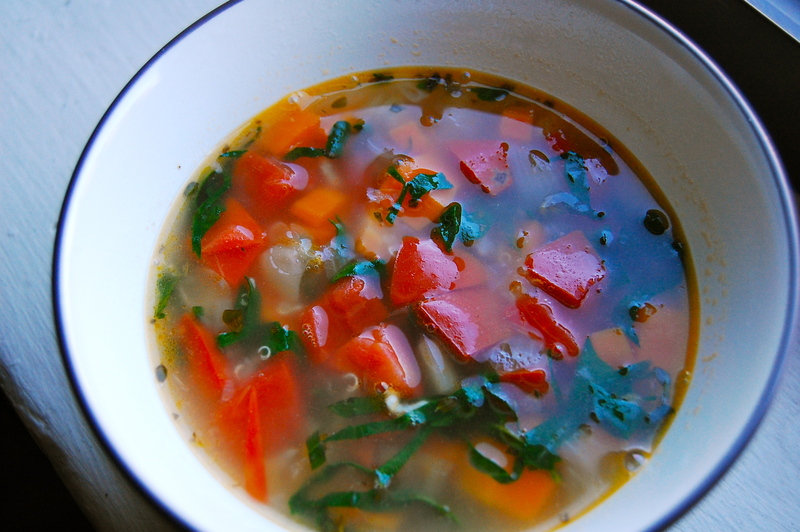 In the end you get a beautiful soup, packed with veggies. I was pleasantly surprised to find that this did not taste at all like licorice. You can taste the fennel, but it’s very subtle and adds a nice flavor to the soup. Isn’t it pretty? Either way, I think you’re gonna like it.